Normally I have a 10-minute rule. If I am scheduled to have a virtual meeting with someone (telephone, Skype, Zoom, etc.) I’ll give him or her 10 minutes to show up before I move on. It’s not rude; it’s about being protective of my calendar. Just as I was about to hang up on my 12:30 pm meeting last Friday—when the clock was yearning to strike 12:40 pm—my acquaintance came barreling onto the telephone scene. It happens all the time. Punctuality is now poisonous. Two weeks ago I was in a face-to-face meeting with four other people. It started on time. Miraculously everyone was present and punctual. About 30 minutes in there was an annoying buzzing sound emanating from the phone of an attendee. Without caring that we were in the middle of a deep conversation about some important matters, the individual grabbed the phone, read the message, and proceeded to excuse himself from the room immediately. The workplace has become a carnival of doing. Everyone is in a constant state of action. Look, over there! It’s people having a meeting to prepare for the meeting that is about a future meeting with a customer. There is less and less time for reflection, pausing, ideation, or even good decision-making. Furthermore, this ‘always on’ mindset is affecting the manner in which we are leading people and initiatives. We scamper from meeting to meeting. We are late. We leave early. We check email, answer texts, and write reports while we’re supposed to be watching a kid’s soccer game. We pretend we’re paying attention to the conference call but instead we are crafting a PowerPoint presentation for our next meeting at 11:00 am. Leaders are in the middle of a coaching conversation with their team member when they suddenly remember they’re supposed to be somewhere else. A lunch meeting between the boss and employee is cut short because the boss has been called into something else. What was originally a 60-minute lunch was cut to 30 minutes. “I guess it’s better than nothing,” said the now jaded employee. Not only is this affecting the way in which we lead—and how colleagues and employees perceive leaders—the inability to manage our time is affecting levels of stress. According to the American Institute of Stress, 80 percent of workers feel some form of stress on the job. 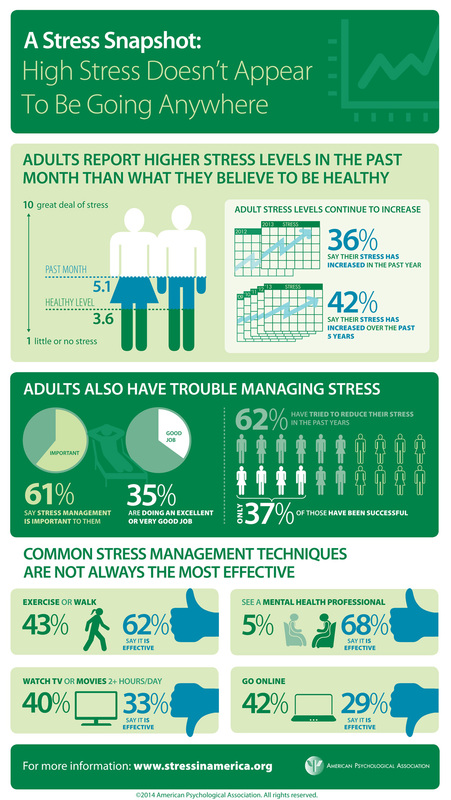 Nearly half say they need help in learning how to manage stress. A whopping 30 percent indicate they are “always” or “often” under stress at work. The American Psychological Association reports levels of stress continues to rise. Analysis by Accountemps reveals 60 percent of employees feel work-related pressures have increased in the last five years. I have seen the enemy. Much of that stress and the downward spiral of leadership is as a result of our failure to manage our calendars, our time. The first step is to take back control of your time. Stop filling up your calendar with mindless meetings. Block out time such that you have more “me time” than you know how to handle. Third, focus on what matters. If you are in a meeting, stay within it and be present. If you are having a conversation with a team member, stay aligned to the conversation not the vibrating feeling of a new text. If you are working on a report, remain in the moment and ensure you do not get distracted by whatever trinket looks more interesting. Time has become the enemy of good leadership. Your job is to reclaim it. You’ve captured the reality of contemporary workplaces. But it doesn’t need to be like that, right? If we follow your lead, we’ll take back our days (and nights). We’ll be more present, with better results for our personal and professional lives. The key point I take away is that IT IS UP TO US. No-one else will do this for us. If we collectively stand our ground and demand our right to manage our calendars/time, and the rights of our direct reports to do so also, we all win. It’s about respect.